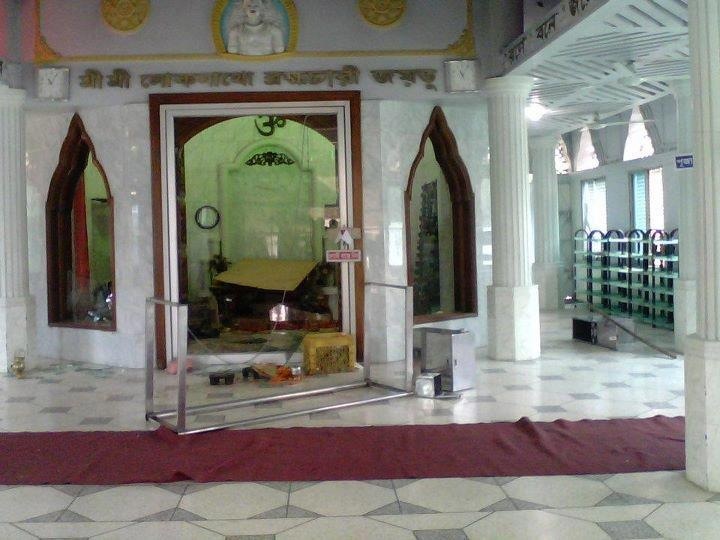 Over the fold are some images from the communal attack on the Hindu community of Hathazari. (Photo credit: RA). There has been two very disturbing incidences in Bangladesh recently, suggesting that my fear of a return of overt communalism may be materialising. Equally worrying is the lack of concern about these worrying trends. If not for the students of Dhaka University, most people wouldn’t have even heard that something happened in Satkhira. Meanwhile, the incidence at Hathazari is forgotten except for some outposts of the blogosphere such as this, this and this. The silence in both cases is puzzling and distressing. Puzzling because in both cases, the government appears to have done the right thing. These weren’t communal riots. Riots require two sides. These were brazen attacks on Hindus. And in both cases, the government moved as quickly and decisively as might be expected in Bangladesh. One would have thought the government’s PR wing to be in full swing to trumpet the prime minister’s leadership. Why the silence then? And why is there a silence from the progressive activists, both within and outside the Awami League? Never mind the mainstream media outlets like Prothom Alo. Where is the progressive blogosphere that got into a frenzy over Meherjaan? It would appear that just like protesting BSF killings is something that only happens when Awami League is in power, concern for the minorities is something for only when BNP is in power. Needless to say, these selective outrages are both disgraceful. Now, the regular reader would know, I don’t really do outrage. Of course, bigotry in every form is to be condemned unequivocally. But beyond that, is there anything more to say? I think there are a few things about the incidence in Hathazari that should have been followed up. I am not in a position to answer any of these questions, but let me ask them. 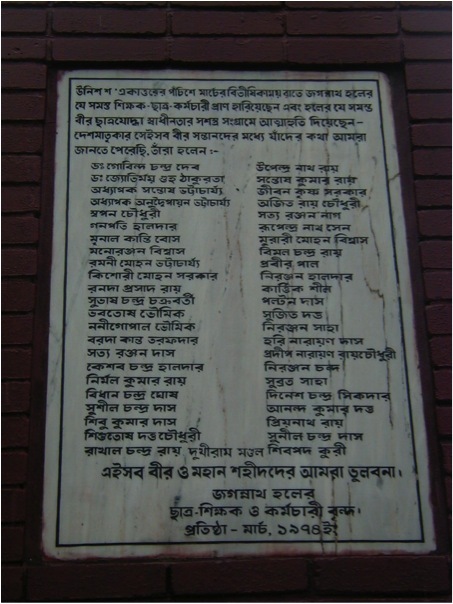 List of names of Hindu students and professors massacred at Jagannath Hall on night of 25th March, 1971 by the Pakistani Army. Click to enlarge. Nirad C Chaudhuri and Jatin Sarker were both born in Hindu families in the Mymensingh district of eastern Bengal, now Bangladesh. Chaudhuri, about four decades older than Sarkar, wrote his autobiography before India held its first election, and ceased to be an unknown Indian. Sarker also wrote his life story. Unlike Chaudhuri, Sarker’s was in Bangla, published in Bangladesh, never translated in English, and not available in India or beyond. He remains unknown. Which is a pity, because if you want to know what has happened to the land where both these men were born, Sarker is a far, far better guide than Chaudhuri. Sarker, of course, stopped being an Indian on 14 August 1947, when Mymensingh became part of East Pakistan — the eastern wing of Jinnah’s moth-nibbled land of the pure. His family didn’t move to India. They were not atypical. Many Hindu families remained in East Pakistan. Perhaps it was the presence of Gandhi. Perhaps it was the fantastical belief that Subhas Chandra Bose would return in 1957 — a century after the Great Uprising, two centuries after the Battle of Plassey — to reunite Mother Bengal. There were no trains full of dead bodies to and from Calcutta. Not that there was no Hindu exodus from East Pakistan. Far from it. In 1941, 28% of the people of the districts that became East Pakistan were Hindus. A decade later, the share had dropped to 22%. By 1961, 18.5%. There were emigrations in dribs and drabs, with major outflows during the communal violence of 1946, 1950, and 1964. There were riots in India, too. West Bengal was a peripheral state in the Indian Federation. Those Hindus who moved from East Pakistan to India — mainly but not wholly to Calcutta — became part of that troublesome city’s doomed citizenry. No one really cared much for them in Delhi or Bombay, where power and wealth resided. What of those who stayed back?